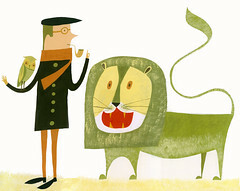 Count Abernathy&#39;s brother Sigmund Abernathy on his first trip to the United States with Mr. Owl bumps into a hungry yet friendly Augustus the lion. I love it! A story book for kids... just waiting to happen! plus.... you are killing me with all the felting cuteness! Sweet mother of design! How did you manage to felt that rooster with the kids!? It' too much! Hi Helen :) Thank you so much for your nice comments ! The rooster took forever to complete and to get the kids on there was especially difficult. you definitely had an imaginary friend when you were growing up. didn't you. how fun.